Ewing’s Sarcoma primarily affects Caucasians, whereas Asian and African populations are considerably less affected. Rates of Ewing’s Sarcoma are found to be higher in North America as compared to Europe or Asia. The rate of prevalence between males and females is not significantly different. Ewing’s Sarcoma is not currently related to any gene mutations or hereditary cancer syndromes. However, relationships between race and inherited familial risk suggests a possible association. 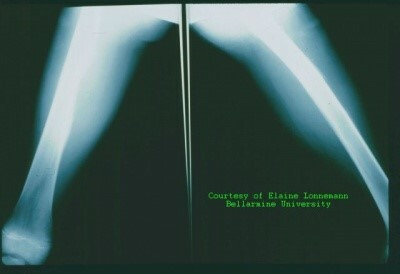 Ewing's Sarcoma is the second most common primary malignant bone tumor of children and the fourth most common overall. 80% of these tumors occur in people under the age of 20. EFT is most common in children between the ages of 5 and 16. Factors include a tall stature or experiencing a premature growth spurt from puberty. In adults risk factors such as infection, radiation, and occupation increase the risk of development of Ewing’s Sarcoma. Ewing’s sarcoma is typically cured 70% of the time in the early stages of metastasis. Teenagers in the range of 15-19 have a lower survival rate of 56%. After the disease has spread, children have a survival rate of less than 30%. It has been found that 95% of Ewing's tumors are derived from a specific genetic translocation between chromosomes 11 and 22. The molecular oncogenesis remains unknown. Local pain at the affected site is usually the initial symptom . The pain may be worse during exercise or at night and can be accompanied by swelling or a lump, redness, and warmth (see picture below). The pain is typically intermittent. Tumors that are deep inside the body such as the pelvis can be hidden from observation and inspection. As a physical therapist, one should be cautious when the symptoms of "growing pains" or a proposed sports injury are out of proportion or abnormal. Osteomyelitis and Ewing's Sarcoma may both present with swelling, redness, low grade fever, and flu-like symptoms. The patient will typically experience intermittent pain with Ewing's Sarcoma versus the constant pain seen with osteomyelitis. The patient may also experience extreme fatigue, weight loss, and loss of appetite with a tumor. Antibiotics will not affect Ewing's Sarcoma, but should help with osteomyelitis. 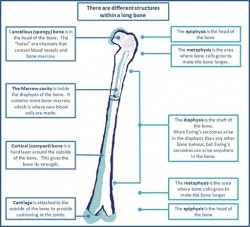 X-rays and Lab values are utilized to distinguish Ewing’s Sarcoma and Osteomyelitis. 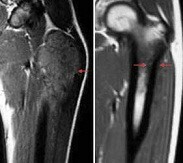 Ewing’s Sarcoma’s symptoms are very general and a differential diagnosis of this condition include tendonitis, Osgood Schlatter disease, trauma, and slipped epiphysis of a long bone. Ewing's Family of Tumors are highly malignant. It most commonly spreads to the lungs, but it can also metastasize to the kidney, bone marrow, heart, adrenal gland, and other soft tissues.Chemotherapy and radiation, which are most commonly used to treat EFT, have many systemic side effects including hair loss, nausea, vomiting, ulcers, and low blood cell count. When diagnosing Ewing’s Sarcoma the first test most commonly used is X-Ray over the painful area. Other tests that may be performed to rule in Ewing’s Sarcoma and determine staging are: bone scans, CT scans, MRI, blood tests (elevated lactate dehydrogenase and red blood cell sedimentation rate) and biopsy. These tests in combination are important to find the location of the tumor and to determine if the tumor is localized or has diffused to other areas of the body to help guide treatment. Biopsy is considered the gold standard test for diagnosis of Ewing’s Sarcoma. The first line of recommended treatment is chemotherapy, also referred to as cytostatic drug therapy, which is given through an indwelling intravenous catheter. Chemotherapy medications most commonly used are vincristine (Oncovin), dactinomycin (Actinomycin D), cyclophosphamide (Cytoxan), ifosfamide (Ifex), etoposide (VePeside, VP-16), and doxorubicin (Adriamycin)Chemotherapy treatment is typically performed in cycles to let the blood cell count recover. The second line of treatment, which can be done before or during chemotherapy, is local treatment. Local treatment includes radiation and/or surgery. Surgery is used to treat the localized tumor when the tumor is easily assessable. When the localized tumor is not assessable as in the pelvis or spine, surgery is not an option and radiation is used to treat the localized tumor. A detrimental side effect that can result from radiation is structural deformities in children. Surgery can also be performed to rebuild a body part or limb. As the child grows, reconstruction therapy will be necessary to lengthen the bone. Follow up intervals of 2-4 months for the first 3 years after completion of therapy are recommended for high-grade tumors such as EFT. Follow up every 6 months for year 4 and 5 and annually after that.Due to recent availability of multi-agent cytostatic approaches and local therapy, the 5 year survival rate has increased from 10% to 70%. Immunological approaches, such as the use of cytokines (interleukins, and interferon), are still being researched. Pre-operative PT is beneficial when feasible. Plan of care should include strengthening of affected limb and aerobic conditioning (precaution: avoid weight bearing on extremity or placing weight distal to extremity in which tumor is located). Post-operative PT is essential but caution must be taken because of the impaired healing process due to chemotherapy. Precautions include: stretching the skin in the area of incision, weight bearing status and lab values (especially platelet count). Some general guidelines include: aerobic conditioning, strengthening, continuous passive range of motion, and aquatic therapy. If amputation is done, it may take the child several months to learn to use a prosthetic leg or arm. A physical therapist will be able to assist in fitting and donning the prosthesis, teaching the child how to use it, and how to use necessary assistive devices. Children may also have a tissue graft, which the child needs to start moving almost immediately. Physical therapy and rehabilitation is typically recommended for six to twelve weeks post operation. 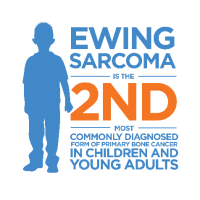 Ewing’s Sarcoma is the 2nd most commonly diagnosed form of primary bone cancer in children and young adults. In this example, a case study of an 18 year old Caucasian female gymnast is examined to help health care professionals identify a possible clinical case of Ewing’s Sarcoma. Ewing’s Sarcoma family of tumors are a group of small round cell tumors that include Ewing’s Sarcoma, Extraosseous Ewing Sarcoma, Askin Tumor, and Primitive Neuroectodermal Tumor. This cancer primarily affects children and adolescents, and most often affects soft tissue and bone. 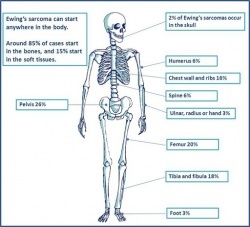 The most common sites for Ewing’s Sarcoma is the pelvis, hip, femur, tibia and fibula. Patient History: Pt. is an 18 year old Caucasian female who reports with a recent history of right hip pain of 5/10 during the day and 7/10 at night. She reports limping from a cartwheel at gymnastics 2 months ago. She reports that she has had night sweats with intermittent fever and general fatigue during the day. Pt. reports that she has had a recent physical examination 5 months ago with her GP who found that she was underweight. GP states this could be possibly due to female athlete triad. She notes that she has been more attentive with her diet and exercise since then. Pt. states her goal is to return to gymnastics pain free and as soon as possible. Examination findings show decreased ROM and weakness of the R hip with palpable pinpoint pain, tenderness, and warmth. No other musculoskeletal abnormalities found to be present. Working diagnosis of female athlete triad and hip impingement. Targeted interventions include strengthening the R hip musculature, improving R hip ROM in all planes, manual therapy to decrease pain and improve function, and modalities for pain relief. Over a period of 5 visits pt’s s/s did not improve. Pain intensified to a 7/10 during the day and an 8/10 at night. PT then determined that pt needed to be referred out for imaging of the hip. Pt went to MD and received X-Ray which indicated a possible tumor of the pelvis. Blood tests indicated elevated lactate dehydrogenase and red blood cell sedimentation rate. MD referred to Oncologist for biopsy which confirmed a Ewing’s Sarcoma of the pelvis. Pt received chemotherapy and radiation. 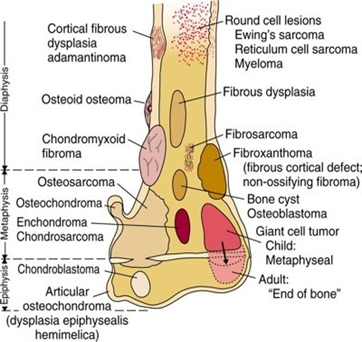 Ewing’s Sarcoma is a malignant bone tumor which in this case affects a female, which is not as common as a male. In this case, the pt. demonstrated constitutional signs and symptoms including night sweats, weakness, fatigue, intermittent fever and increased pain at night which could indicate a systemic problem. Physical therapists should be aware that Ewing’s Sarcoma can mimic musculoskeletal signs and symptoms which can make it difficult to diagnosis. It is imperative to monitor the patient and refer out to patient’s MD when appropriate to prevent further metastasis of the tumor. The pelvic and hip region is the most common area affected by Ewing’s Sarcoma and can be difficult to observe and palpate due to its location. In this case the pt did not improve upon multiple visits which would indicate it is not a musculoskeletal pathology and the pt. was referred to her primary care provider for further testing. ↑ 1.00 1.01 1.02 1.03 1.04 1.05 1.06 1.07 1.08 1.09 1.10 1.11 Paulussen, Michael. Frohlich, Brigit, Jurgens, Herbert. Ewing Tumour: Incidence, Prognosis, and Treatment Options. Pediatric Drugs 2001; 3(12); 899-913. http://www.ncbi.nlm.nih.gov/pubmed/11772151 (accessed 28 Feb 2011). ↑ 2.0 2.1 2.2 2.3 2.4 2.5 2.6 2.7 2.8 Goodman, Boissonnault, Fuller. Pathology: Implications for the Physical Therapist. Pennsylvania: Saunders, 2003. ↑ 3.0 3.1 3.2 Medline Plus. Ewing’s Sarcoma. http://www.nlm.nih.gov/medlineplus/ency/article/001302.htm (accessed Feb 2011). ↑ 4.0 4.1 4.2 4.3 4.4 4.5 4.6 4.7 4.8 4.9 Grimer, Robert, Athanasou, Nick, Gerrand, Craig, Judson, Ian, Lewis, Ian, Morland, Bruce, Peake, David, Seddon, Beatrice, Whelan, Jereamy. UK Guidelines for the Management of Bone Sarcomas. Sarcoma 2010; 1-14. ↑ 5.0 5.1 5.2 5.3 5.4 5.5 5.6 Elaine Lonnemann’s Powerpoint, Oncology. Pathophysiology of Complex Patient Problems. Bellarmine University 2011. ↑ 6.0 6.1 6.2 6.3 6.4 6.5 Ewing sarcoma. Bone Cancer Research Trust. https://www.bcrt.org.uk/information/information-by-type/ewing-sarcoma/. Accessed April 5, 2017. ↑ 7.0 7.1 7.2 7.3 Burningham Z, Hashibe M, Spector L, Schiffman JD. The Epidemiology of Sarcoma. Clinical Sarcoma Research. https://www.ncbi.nlm.nih.gov/pmc/articles/PMC3564705/. Published 2012. ↑ 9.0 9.1 Karosas, Ann O. Ewing’s sarcoma. Am J Health-Syst Pharm 2010; 67; 1599-1605. http://www.ajhp.org/content/67/19/1599.full.pdf+html (accessed 28 Feb 2011). ↑ Ewing’s SarcomaTreatment. National Cancer Institute. https://www.cancer.gov/types/bone/hp/ewing-treatment-pdq#link/_153_toc.